The evolution of President Trump’s advocacy for applying the death penalty to drug dealers was an indirect one. First, Axios reported that he was talking about it to friends. Then, he mentioned how, in some countries, drug dealers paid “the ultimate penalty,” an unsubtle hint that Axios’s reporting was on the money. Then he called for it explicitly. Then Attorney General Jeff Sessions made it policy, to the extent that he could. 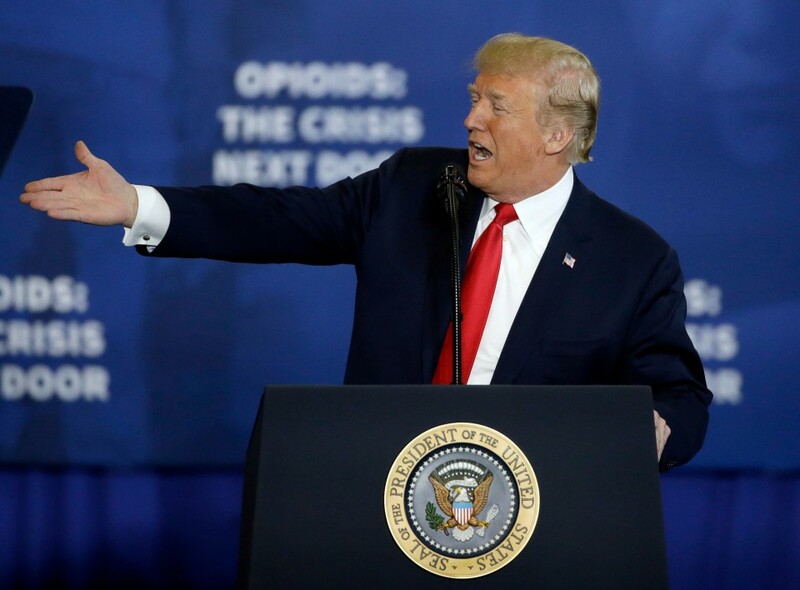 With deaths from opioid abuse hitting a new high last year, Trump has been under pressure to take steps to curb the problem. This is now a central proposal in that effort. 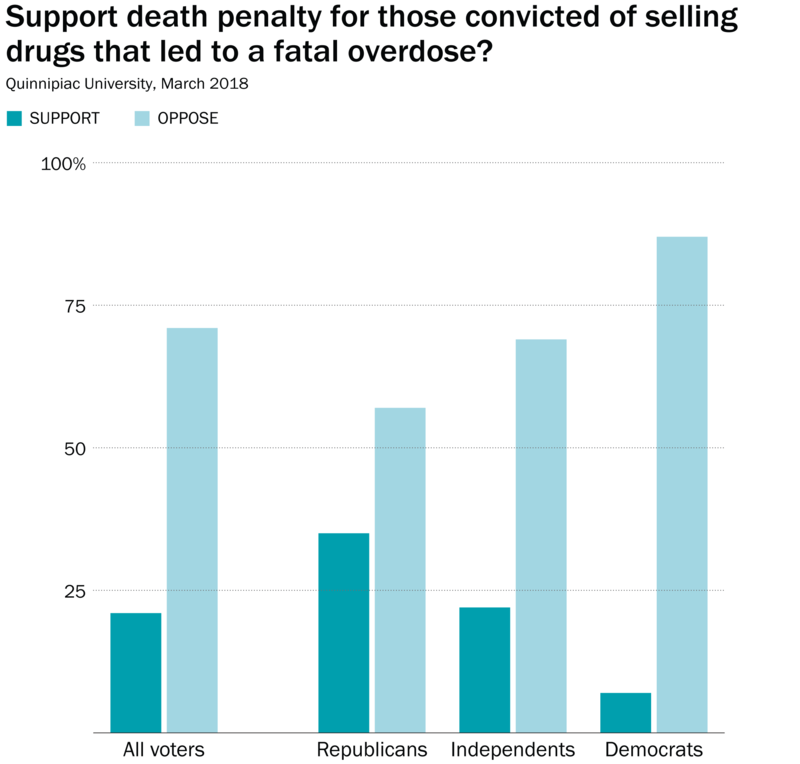 A new poll from Quinnipiac University, though, shows that most Americans oppose the idea of executing those convicted of selling drugs that lead to a fatal overdose. Nearly three-quarters of Americans oppose the idea — including more than half of Republicans. What’s more, three-quarters of Americans — and, again, a majority of Republicans — don’t think Trump’s proposal would actually do anything to curb the opioid crisis. Only a third of members of his own party think it would help, and only a fifth of Americans overall. We will note here, because social media demands it, that 57 percent of Republicans (the percentage that opposes Trump’s proposal) is not 100 percent. In other words, there are plenty of Republicans who support the idea — just fewer than the number of Republicans who oppose it. Why mention this? Because a common response to polling these days is something along the lines of “Fake news; I’m a Republican and I support Trump! !” Worry not: This poll does not suggest that you do not exist. 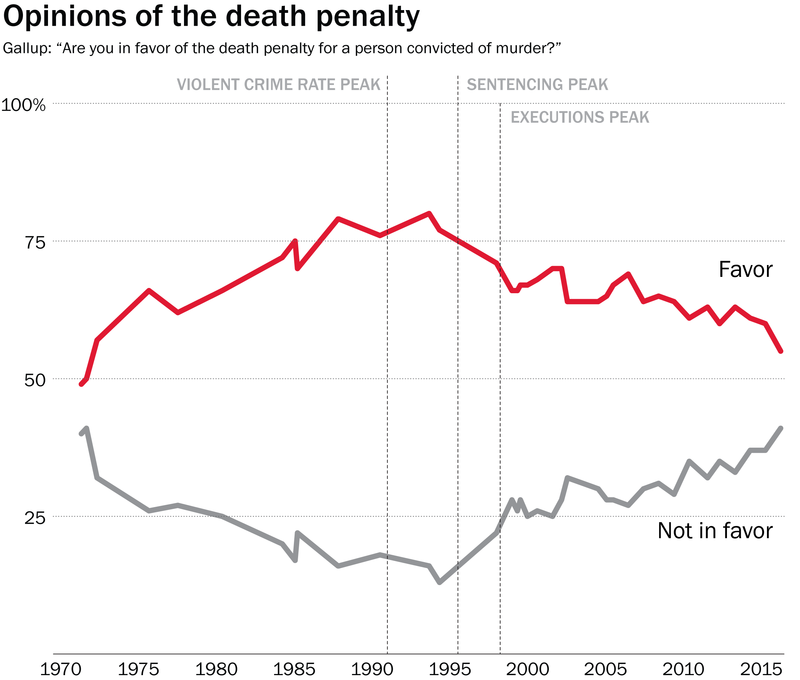 Quinnipiac also found that Americans aren’t generally averse to the death penalty, an important bit of context. Nearly 6 in 10 respondents support the death penalty for those convicted of murder. That percentage is in line with other recent polls. We looked at Gallup polling last week; its most recent survey, from October, has support for the death penalty at 55 percent — a recent low. The figure has slid downward along with the violent crime rate, the number of people sentenced to death and the number of actual executions. 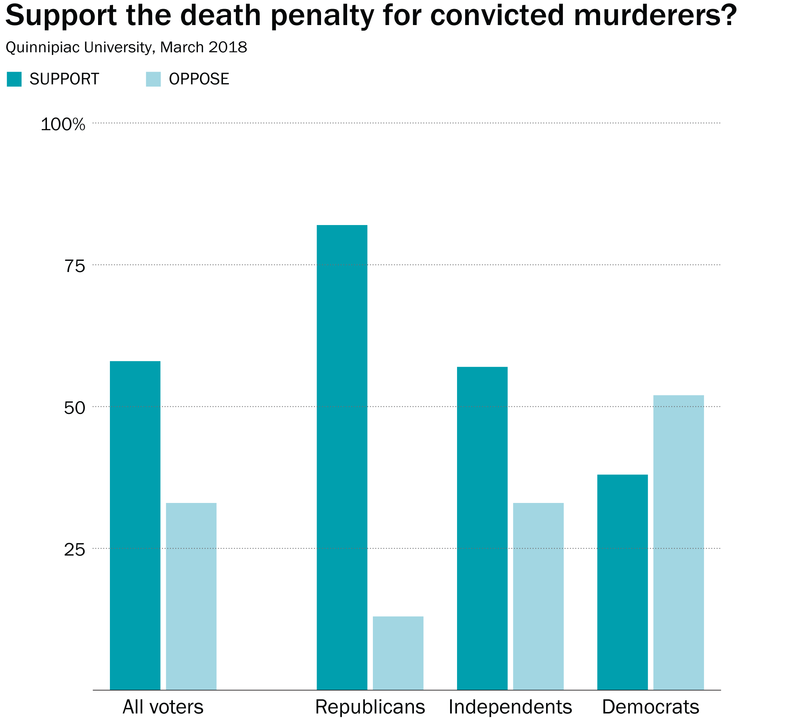 So this is not an anti-death-penalty pool of respondents. Just, it seems, for drug dealers. It’s worth noting that Quinnipiac also asked which punishment respondents preferred for convicted murderers. A small majority felt that life in prison was the better option (though, again, they didn’t all necessarily oppose the death penalty). 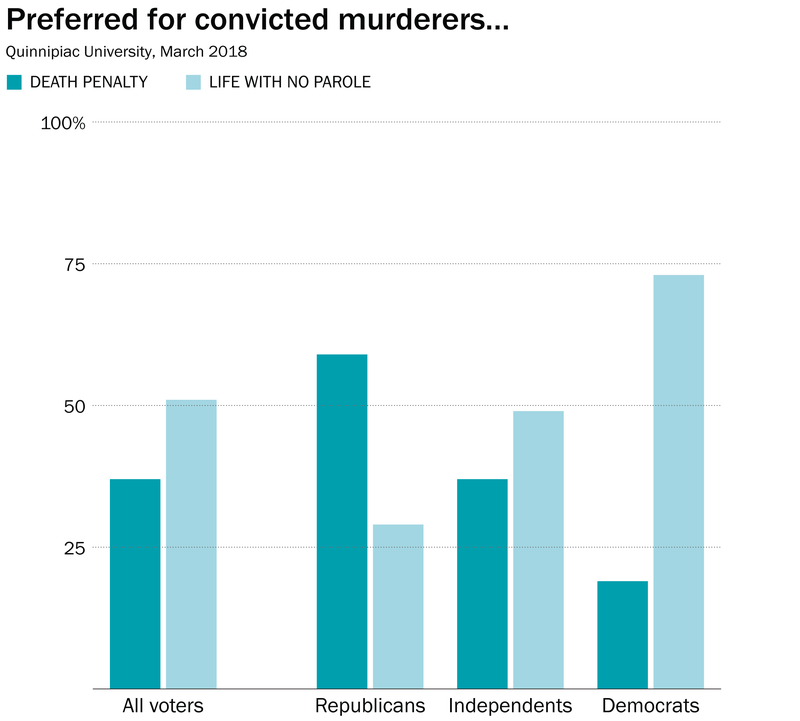 Only among Republicans do a majority think the death penalty is preferable to life for a convicted murderer. Trump’s proposal, as with many Trump proposals, is not politically popular. For the purposes of implementation, that doesn’t really matter. 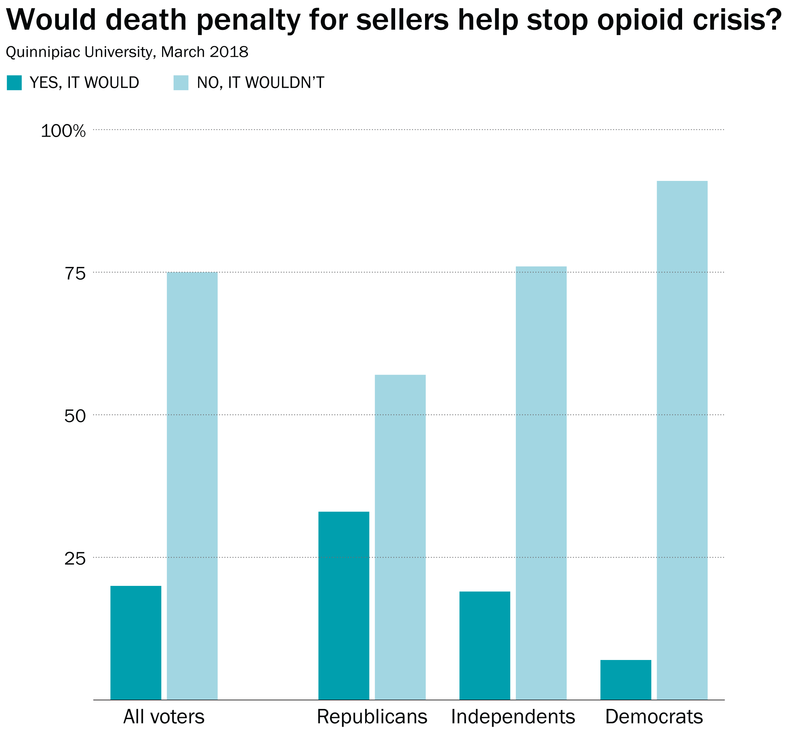 It’s not clear that his administration’s new emphasis on the death penalty will result in a significant increase in death sentences, but Trump’s quiet emergence as a proponent of executing dealers has had at least one desired effect: It’s part of the public conversation.